Place rice in a bowl and mix in the brown rice vinegar and mirin. Toss to fluff and cool the rice. Slice the avocado into 1/4 inch thick wedges. Cut each sheet of nori, with scissors, into four equal size squares. Spread a thin layer of rice, about 1/4 cup, on top of one square. Moisten your fingers slightly and press the rice firmly until the most of the square is covered. Place a strip of carrot on a diagonal, spanning from one corner to the opposite corner. Spread a small amount of wasabi along one side of the carrot. Sprinkle a little Eden Shake on top of the wasabi. Place 1 or 2 slices of avocado and a little radish sprouts on next. 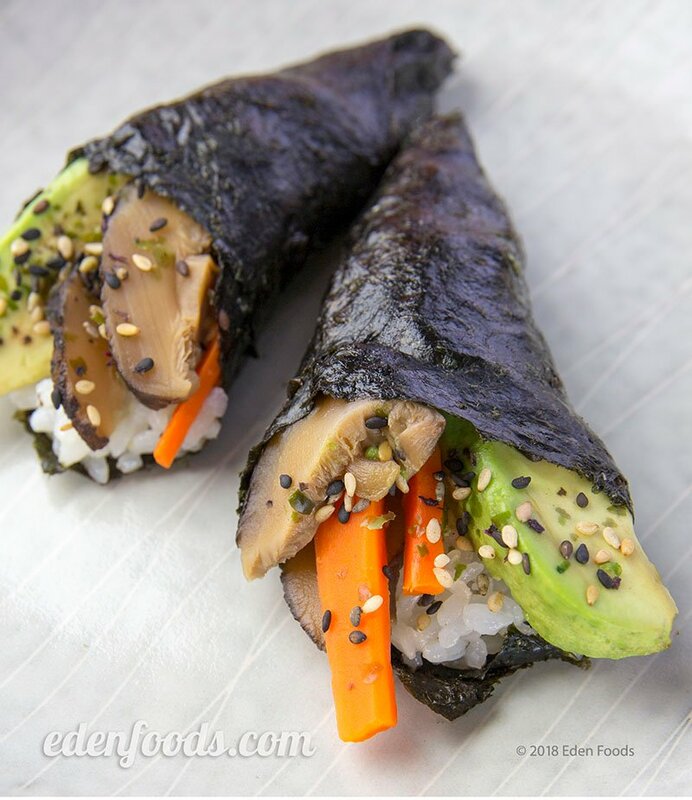 Take one corner of the nori square and fold it over the filling and roll into a cone shape. Repeat the above steps until all cones have been rolled. Equals 16 cones. Eat as is like a sandwich or dip into a little Eden Shoyu Soy Sauce before eating.